Activists for climate justice in Africa say national governments in Africa need to be climate sensitive and responsible to justify the fight for developed countries to be accountable for climate pollution. “Are we making sure that climate change issues are taken into consideration when we are planning our impact assessment or design of bridges and roads? Are we taking into consideration the potential effects or impact of climate change?” quizzed Reuben Ottou of the Ghana Wildlife Society. 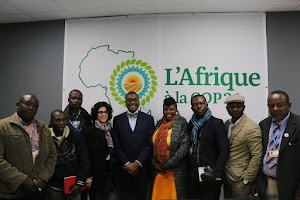 The West Africa Regional Meeting of Pan African Climate Justice Alliance (PACJA) has been drawing up an action plan for the region for the next two years. For the next two years, PACJA will work at strengthening National chapters and link them with other regional organizations such ECOWAS, AfDB, UNEP, OXFAM for the purpose of resource mobilization. The strategy is to strengthen West Africa countries to effectively engage with their governments and ECOWAS in climate change and Post 2015 policy dialogue processes. Civil society groups at the meeting expressed commitment to continue engaging national authorities “to continue the fight against climate change right at our backyard before we can project it to the international level”. “We need to make sure these things are effectively integrated into national planning schemes from the sectorial level and more importantly to the local government level where more action are supposed to be happening,” said Mr. Ottou. Samuel Ogallah Samson, PACJA Program Manager, noted that West Africa has the largest number of national platforms – the Alliance has opened more than five national chapters in less than one year. He indicated that PACJA will continue to support regional activities in all the regions in Africa and urged the West African CSOs to “work in unity and cherish our strength in diversity”. Charles Agboklu, National Coordinator of Religious Bodies Network on Climate Change (RELBONET) in Ghana emphasized the need to ask African governments to set a budget for climate change activities in adaptation and mitigation. “We are also calling for national budgets to reflect specific climate change activities and the new and additional concepts that we have in climate change to see clearly that our governments are tackling climate change effectively,” he said.